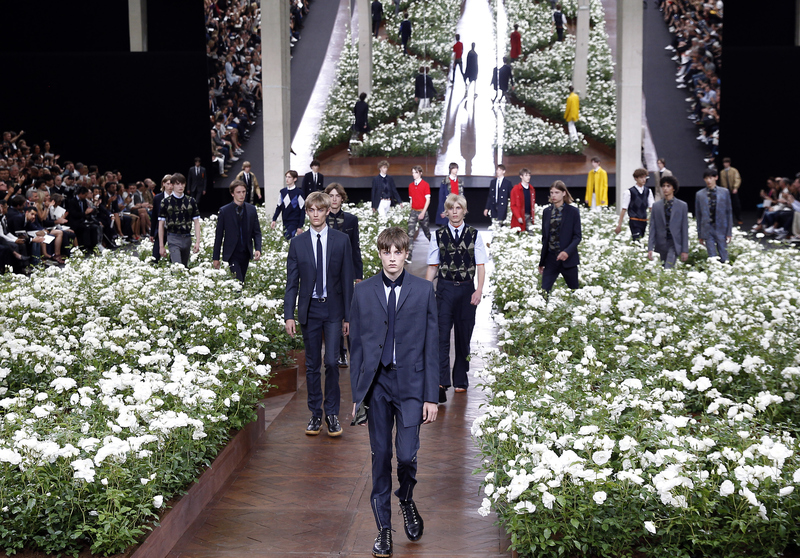 Summer was on full exhibit at the Dior Homme Spring Summer 2016 collection walk at Men's Paris Fashion week yesterday. Thousands of white roses lined the venue's catwalk of wooden parquet flooring in a labyrinth-like display of blossoms while huge mirrors served as the backdrop of the show to enlarge the French summer garden theme. The collection from the men's division of the French fashion house Christian Dior showed off pieces ranging from traditionally masculine navy blue suits, ties, blazers, and vests to more colorful — and camouflaged print — ensembles using pops of orange, yellow, and red. The flowery show worked perfectly in an already summer setting and also paid tribute to Christian Dior's famous love of blossoms. Actor Boyd Holbrook — recently announced as the new face of Dior Homme — was seen at the show, as well as James Franco's brother, Dave Franco, and actor in the upcoming Star Wars film, Adam Driver. The latter two took the opportunity to bring along dates to the show. The metaphorical "bloom" as seen in the final walk by the gradual increase of color and patterns in the clothes delighted the audience as the roses created an atmosphere where everyone wanted the perfect photo. Dior Homme's fascinating and gorgeous exhibition of next summer's styles are sure to inspire this season's looks with plenty of room to duplicate the looks as so many of the ensembles include fashion staple pieces already common to menswear.